Stay Tuned For 4/20 Deals All Week Long!!! Thank you very much for visiting us. We offer fast, reliable, delivery of quality marijuana products right to your door. Free Delivery in Kitchener, Cambridge, Waterloo & Guelph on orders over $80! Orders less are subject to a $15 delivery fee. With new items arriving daily and pricing for all budgets, our educated staff are doing their best to help patients find the right medicine for their specific needs! THC distillate is a purified, solvent-free cannabis extract that has a THC levels of 98% . Our clear golden concentrate is purged of all waxes, fats and oils during the filtration/distillation process using the most advanced technology to produce a pure thick clear oil that can be consumed as an edible, used as a topical, or smoked/vaporized! This is an extremely thick oil in a glass syringe. Gently warm up the syringe before use. Hawaiian Honey Creeper Terp Nectar 1000mg - 1g - $70 SALE!! Sweet Leaf Concentrates Afghani Kush Shatter is an Indica strain with tranquilizing qualities that numbs body pain and help users regain their appetite. The herbal and spicy pine flavors fuse to create a unforgettable taste. For a full body high followed by cerebral clarity, dab on aromatic flavors of Sweet Leaf Concentrates’ Afghani Kush Shatter. Get back in touch with your muse when you dab on the zesty flavors of Sweet Leaf Concentrates Green Crack Shatter. For the full experience of terpene flavors, let your nail cool down for up to 30 seconds then take the dab of Green Crack. Your taste buds are immediately bombarded with earth and sweet citrus flavors then followed with a rush of euphoria. The Sativa effects will spur creative and generate fresh ideas. For localized pain relief of joint pain, inflammation and muscle soreness, plus heat. Combining the deep painkilling properties of cannabinoids with the tingling, soothing sensation of heat, for intense localized pain. 50ml contains 450mg Full Spectrum Cannabis Oil General Warning: Product contains medical cannabis. While allergic reactions to natural ingredients are extremely rare, you hold harmless Herb Angels and Tri City Herbal Delivery Service for any possible reactions. Remember to read our labels and ingredient lists carefully and consider an allergy patch test if there is any doubt or history of skin reactions. If any redness or itching occurs, discontinue use immediately. Any reference to medicinal or health benefits cannot be taken as a replacement for medical advice or prescription medication. Products are for external use only. Ingredients: Shea seed extract (Butyrospermum parkii), cannabis oil extract, essential oils [ceder (Junipers Virginiana), wintergreen (Gaultheria procumbens,) cinnamon (Cinnamomum cassia), spikenard (Nardostachys jatamansi), chilli seed (Capsicum annum L), black pepper (Piper nigrum), ginger grass (Cympogan martini)]. Usage: Gently massage a pea size amount onto freshly cleansed skin. May be applied onto affected area to soothe and relieve pain of muscles, joints, or dry skin. Repeat as needed. Sweet Leaf Concentrates MK Ultra Shatter is an Indica-dominant Hybrid with a pungent palate of earth flavors. The master extractors in the Sweet Leaf Concentrates labs use premium flowers to extract therapeutic cannabinoids and preserve the sweet terpenes that make up MK Ultra’s personality. Her sedative effects relaxes anxious nerves while the rest of the body falls into a state of tranquility. For Vapers looking for a discreet method of vaping, the Firefuel Keychain Battery is convenient way to enjoy your favourite distillate strains and flavour. Fits a 510 thread cartridge which is the most widely used cartridge thread size. When you party too hard under the sea, count on therapeutic benefits from Sweet Leaf Concentrate’s Rockstar Tuna Shatter to leave your body feeling rejuvenated. Soothe head banging migraines and mild inflammation when you dab on Rockstar Tuna. This Indica-dominant Hybrid offers up surprising hints of herbal spices and grape and builds up an intense high that leave the body hopelessly couch locked. Sweet Leaf Concentrates White Widow Shatter is a Sativa concentrate that releases a powerful burst of euphoria and energy when dabbed. White Widow’s pungent palate expresses notes of earth and wood and her energetic essence simulates creative and focus. Sweet Leaf Concentrates White Widow Shatter offers up sugary cloud of dank citrus and accompanied by chronic pain relief. Show your merit and find your focus when you smoke on Sweet Leaf Concentrates Girl Scout Cookies Shatter. This Indica-dominant Hybrid blends herbal flavors with bursts of berries and vanilla to balance the spiciness. Sweet Leaf Concentrates Girl Scout Cookies Shatter has earned many badges and is most effective at treating cramps, inflammation, and muscle spasms. Though Amnesia is a state of memory loss, this is one strain you won’t soon forget! Amnesia Haze Shatter is strong uplifting sativa. 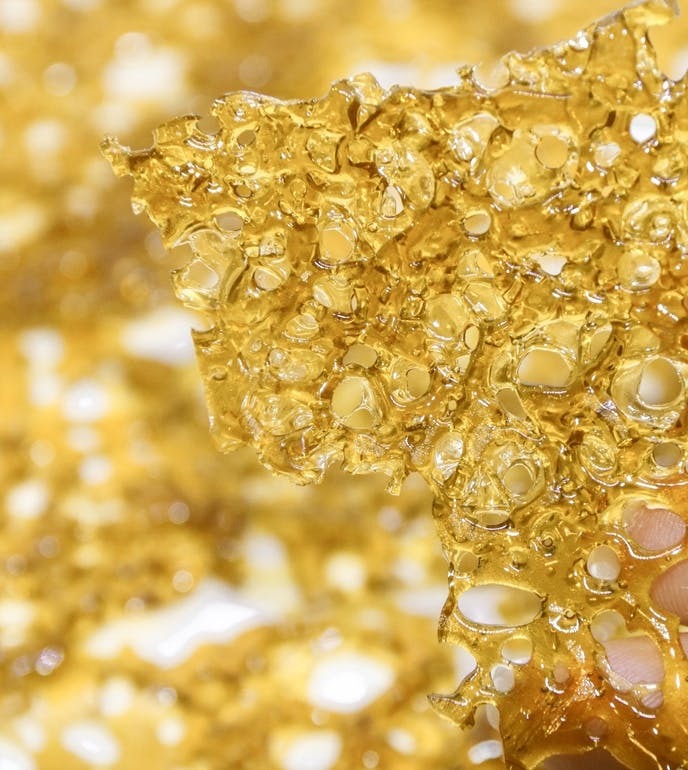 You’re more likely to be creative and inspired after a dab of Amnesia Haze Shatter. The strain itself has won multiple awards in different years. With only one small dose Amnesia Haze Shatter is guaranteed to leave you in a euphoric Haze. Solventless THCa - 1G - $80 NEW PRICE! Sweet Leaf Concentrates Bubba Kush Shatter is a sweet smoke that offers up a sedative essence that seduces the body into serene slumber. This concentrate is heavy with her Indica effects. Her influence wipes away signs of stress and pain while turning insomnia into a thing of the past. Enjoy the traces of earth and wood flavors in Sweet Leaf Concentrates’s Bubba Kush Shatter. Dab with care, her potency is not to be underestimated. Get lost in the cloud of fragrant haze when you dab on Sweet Leaf Concentrates Comatose Shatter. Stench as potent as the effects of the strain, Comatose is a rich strain that carries robust pine flavors with muted notes of herbal and berry. Beware of her Indica effects, they’ll crush you under a heavy blanket of relaxation that penetrates through barriers of stress. Even the smallest dab of Sweet Leaf Concentrates Comatose Shatter will send you sailing through epic relief. Sweet Leaf Concentrates Pine Tar Kush Shatter leaves you blissfully stranded in a paradise of euphoria. Break into the amber shatter and watch the nectar vaporize into a fragrant mix of wood and pine flavors. Pine Tar Kush Shatter expresses Indica dominancy and releases potent cannabinoids that quickly activate relieving muscle spasms, cramps, and insomnia.